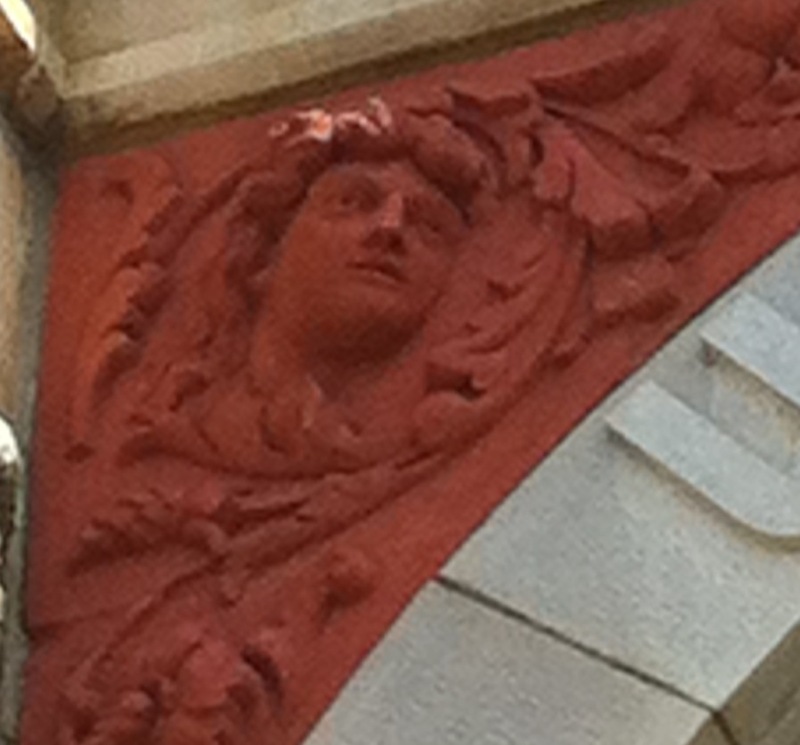 May’s penultimate Architeaser was one of the helmeted heads which overlook doors to the Pulaski County Courthouse. 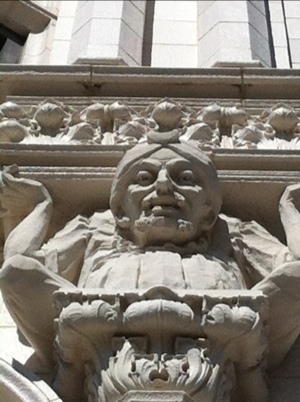 Like the May 29 Genies and Union Life Building, the Courthouse and helmeted heads were the brainchild of George R. Mann. The courthouse was an expansion of the original 1880s courthouse which this adjoins. Mann did not try to duplicate the architecture of the original structure but instead built an impressive neo-classical “governmental” building which has a more timeless look than the original structure. Day three of the Little Rock film fest starts at 2:10pm with The World Before Her screening at Riverdale and concludes with the Afterparty at the Peabody Hotel which starts at 10:30pm. In between the following films will be screened, most at Riverdale: Teddy Bear; Booker’s Place: A Mississippi Story; Andrew Bird: Fever Year; In My Mother’s Arms; High Tech, Low Life; Booster; and Beast of the Southern Wild. Also being shown, and with filmmakers in attendance will be: America’s Parking Lot; Daisy Bates: First Lady of Little Rock; Pilgrim Song; My Dog Skip; Future Weather; The Mayor; Journey to Planet X; Planet X: Part II – The Frozen Moon; and It’s in the Blood. 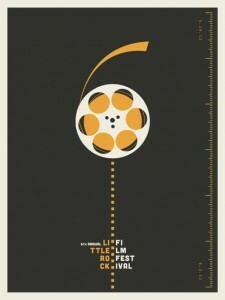 The Little Rock Film Fest features short films as well as features. Many of these filmmakers will be in attendance at the screenings. The World Shorts which will be screened are (in the Other Worldly grouping) “Golden Ears,” “Man in Fear,” “HWY,” “Animeditation,” “Bunker 731,” “The God Phone”; (in the In the End Let’s Feel Good grouping) “Busted Walk,” “Die Beobachtung,” “Happy Voodoo,” “Chin Up,” “The Assignment”; (in the Closing In grouping) “The Carnival Is on Fire,” “Infinity,” “Abigale,” “Homecoming,” “The Darkness Is Close Behind”. Other highlights will be Matt Owen discussing movie posters, a music video competition and show at Stickyz and a filmmaker reception. 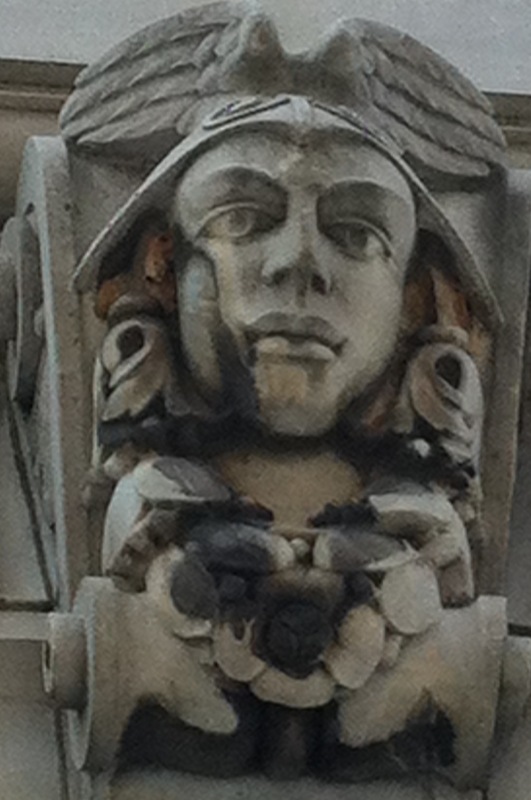 Yesterday’s Architeaser was one of the four genies on the facade of the Centre Place building located at 212 Center Street. The building was designed by George R. Mann and was constructed between 1911 and 1917. In 1981 it was added to the National Register of Historic Places. Mann’s design was heavily influenced by buildings being constructed in Chicago at the time and also includes Beaux Arts elements (of which the genies are). The Little Rock Film Fest continues on day two with programming at two Little Rock cultural institutions. At 4pm Little Rock Zoo hosts a zoo keeper chat about elephants. This will be followed at 4:30pm by the documentary The Eyes of Thailand. At the Riverdale cinemas the first two films will be shown this evening: at 7pm, Richard Linlater’s Bernie will be shown while Daryl Wein’s Lola Versus will start at 7:30. The Arkansas Arts Center plays host to a reception honoring filmmaker Jay Russell, an Arkansas native. Following the 7:30 reception, Philip Martin will moderate a discussion with Russell at 8pmThe program will also feature clips from some of Russell’s movies. Beginning at 9:15, the Arkansas Arts Center will host a Garden and Gallery party for filmmakers, Gold and Silver pass holders. 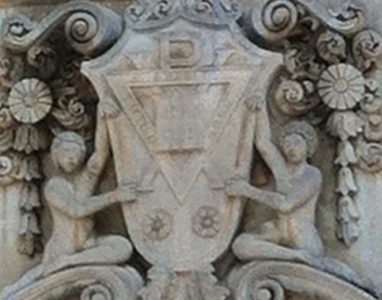 Yesterday’s Architeaser featured two people holding a crest over the south entrance of the old YMCA building at Broadway and Sixth Streets. The building was built in 1928 and added to the National Register of Historic Places in 1979. The 2013 Little Rock Film Festival kicks off tonight with the screening of the documentary, America’s Parking Lot. The film will be shown at 7pm at the Argenta Community Theatre. At 6pm, Gold Pass holders can attend a special reception on site. Following the film at 9pm, a tailgate party will take place outside. Montgomery Trucking will provide musical entertainment while guests eat food provided by Whole Hog and Ben E. Keith. Yesterday’s Architeaser featured the front doors of the Cathedral of St Andrew. It depicts each of the twelve apostles post resurrection. The building was designed by Thomas Harding and opened in 1881.